Our hot tubs don't have huge motors so the amperage is more suited to existing panels. A direct wired 40 amp GFI (ground fault interrupted) breaker circuit is required although the system will run on 30 amp GFI if needed. #8, 3 conductor wire should is required. Consult and electrician to verify this is with in your local codes. This is a very common question given the natural properties of our tubs. By law the FDA only approves as a sanitizer, chlorine or bromine. However, there are two other natural oxidizing systems that we recommend. By using any one of these system, the amount of sanitizer can greatly be reduced. The 1st is an ozonator (hyper link https://www.cedartubs.com/images/aqua/ozone-water-pur.jpg) that used UV light to produce naturally occurring ozone . Ozone leaves nothing but pure oxygen when consumed. It is 1000 times stronger than chlorine in oxidizing, however it has a very short life and dissipates quickly. 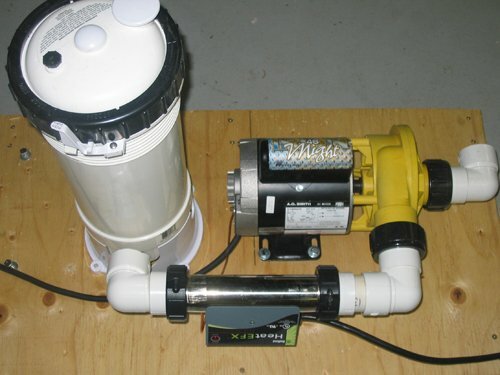 The other system is a mineral ionizer, this uses natural minerals such as silver, and zinc to kill bacteria and algae. When you use these systems you greatly reduce the need for bromine or chlorine sanitization. When you use both you can virtually eliminate the need for chemicals, however the FDA has not yet recognized these and as such small amounts of sanitizer should still be used. No, wood is different than plastic and reacts differently to certain chemicals. The use of standard Chlorine commonly used in pools and some spas can actually damage the wood fibers over time. Our sanitization system uses bromine salts accompanied with other natural products that we consider "safe for wooden hot tub" . Please call us to ensure the chemicals you are using will not damage your wooden hot tub or visit our chemical/parts store to purchase chemicals that are "approved" for use with wooden tubs. No our hydro massage systems re engineered around a venturi jet. We use a full 1 1/2" air line to get maximum air volume through the jet body, providing a very powerful massage. In the past we had offered a blower system but customers found it was very noisy (like having a large vacuum cleaner beside the hot tub), and we have since discontinued this option. The Venturi system, was originally patented by the Jacuzzi brother in 1968. Since the expiration of this patent, the venturi jet has now become the standard for modern spas and hot tubs, not only is it quieter but it uses no extra electricity making it very efficient. Northern Lights Cedar Tubs Inc. has partnered with a select few European distributors that are much better able to service most European countries locally. These dealers have hands on assembly training, and posses key product knowledge. They maintain a full line of inventory for viewing including spare parts for faster service. These dealer offer value added services including assembly and installation. Previously the additional costs and paper work/regulations associated with importing our tubs and saunas into Europe, made it very difficult for European customers to enjoy our product. We are now very excited to have strong dealer representation throughout Europe! Please contact a dealer closest to you to arrange a viewing of our World Class Products. Northern Light's Engineers have designed many alternative cottage heating methods, however the idea of a wood fired hot tub is to drain it after use. I can not be left filled in freezing conditions, unless an auxiliary circulating pump and a 1.5Kw heater is used in conjunction with the wood heater. Whether you have selected the pre assembled option or the kit form, you tub will arrive securely wrapped ona pallet. Most customers will opt for residential delivery which means a carrier will bring the tub to your house. In this case the local carrier will contact you to arrange a suitable time for delivery. they willmake every effort to unload the tub at the point of driveway or curb side.They will also attempt to have tailgate delivery arranged to assist in unloading the hot tub. In some areas tail gate lift trucks are limited or unavailable. In this case you will need to either remove the pieces off the pallet by hand (driver will usually give you a hand). If the tub is pre-assembledyou will need to gather a few friends or neighbor to assist. Note for insurance reasons, thecarrier will not position the tub to its final site, only as far as a safe drop of spot. You can pay by a variety of methods, Money/wire transfers are the easiest and most preferred method, accepted in either US $ or Canadian $ currency. We accept visa or master card directly. Alternatively we accept Paypal which allows you to pay via most credit cards including Amex and Dinners (click here www.paypal.com to sign up if you do not have a Paypal account it is free and takes less than 1 minute). We also accept any form of bank payment including bank draft, certified check, or money order (sorry no personal cheques). In today's spa market, companies are completing on the number of jets. Given a specific piping system that supplies water to the jets, the horsepower power needs to increase in a cubic fashion with flow. For example if flow needs to be doubled horsepower needs to increase by 8 times. Thus when many jets are utilized, the jets will be small flow rate jets. Otherwise the horsepower that the pump(s) would have to deliver would be monstrous. Thus a 60 jet spa coupled with a 2 HP pump will not produce anywhere near as powerful of a massage as the same pump powering 6 large flow jets . We match our pumps and jets so that a 4 jet hot tub will come with a 1.5 HP pump, a 6 jet tub will utilize a 2 HP pump and an 8 jet tub will utilize a 3 HP pump. We also offer a 14 jet tub, but this tub will be supplied with two 3 HP pumps. Jet companies rate their jets in gallon per minute of flow @ a specific psi of pressure. For example we use jets that require 13 USGPM and, at that flow, will produce a pressure drop across the orifice of 12psi. Thus for example If you have a 4 jets each requiring 13 gallons per minute then your pump must be capable of delivering 52 gallons per minute and also produce sufficient pressure so that there is still 12 psi left for the jets after the pressure drop losses in the piping and components are factored in. We design our tubs to be simple yet effective. As the flow requirements increase because of the number of jets deployed a point is reached where the plumbing design must also be changed. This can include increasing the pipe and component sizes, adding one or more suction fittings and changing the filter design. This is done in addition to changing the pump size and the number of pumps. Package#1 (small 4'8") 60"x60" x32" weighing 500lbs. 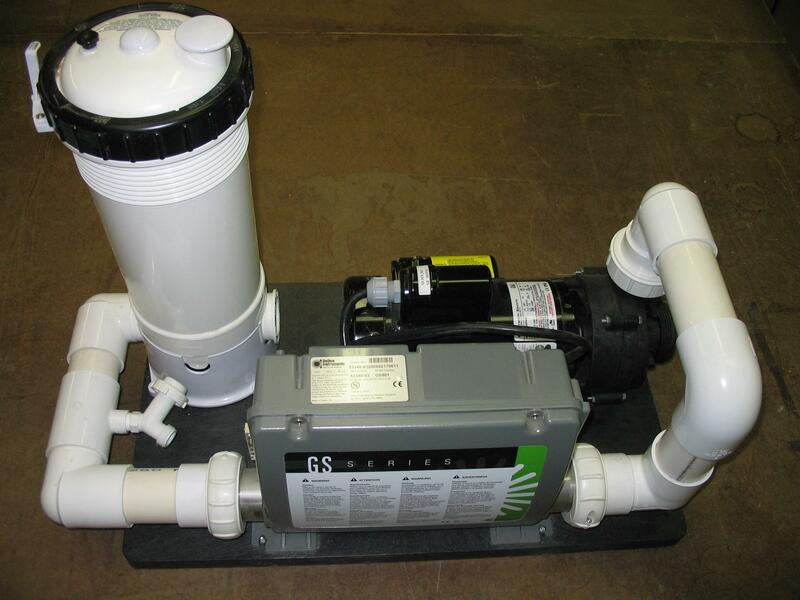 The pump , heater and filter are pre- assembled and wired (hyperlink to attached image) as a unit on a special plastic skid plate taking up a total area ofapprox 29" length 15" width and 21" high. This skid pack is design to easilyfit into our custom cedar enclosure view image. This pre assembly greatly reduces the amount of time a customer will spend on final hook up! Minimum length is 34 inches, minimum width 18 Inches, minimum clearance from foundation to bottom of deck joists 22inches. Minimum length 38 inches, minimum width 16 Inches, minimum clearance from foundation to bottom of deck joists 22inches. We ship any where through out US and Canada! We will make all the arrangements including residential delivery to a home or a cottage. If you are ordering from the USA there are no taxes or duties,we cover anyhandling fees for paper work crossing the board. Our products can also be purchased overseas through a wide network of dealers . If you don't see a dealer in your country call us! If you are interested in becoming a dealer please contact us or fill out our become a dealer form. Yes we are very serious about offering a product that is made from a renewable resource. Unlike plastic tubs that are made from petroleum by products, the wood we purchase is harvest directly by a Certified Sustainable forestry mill. The cedar trees have been approved for Sustainable Forestry Initiative SFI since 2001. This Mill has also been audited and approved by KPMG performance registrar. Sustainable Forestry Initiative is an international standard for certification of forestland. It is a comprehensive system of principles ,objectives and performance measures developed by scientists. For more information please visit www.aboutSFI.org and www.certificationcanada.org to get a better overview of the practice of sustainable forestry management. In 1993 the Food Research Institute at the University of Wisconsin conducted tests to compare wood surfaces of cutting boards with the plastic equivalents. The assumption was wood would absorb the juices and become a hot-bed of disease. In other words, plastic would be safer. This wasn't the case. Seven species of wood and four types of plastic were tested. All were intentionally contaminated with E-Coli, Listeria and Salmonella. To everyone's surprise, the bacteria were killed within 3 minutes of touching the wood surface. This was not the case with the plastic surfaces. Cedar is in fact naturally resilient to decay. It's rich oils give cedar the lifespan it is famous for. Cleaning is the same as most plastic tubs. Typically a light scrub brush with a diluted solution of liquid bleach works well. Experience! Our tubs are 43" deep, providing a unique soaking effect that is not available in shallow plastic spas. The aromatic smell of cedar coupled with the relaxing soak, and therapeutic massage provides a unique experience. The air vent adds bubbles to the jets giving a more intense massage. However, because it adds cold air to the water, it should be shut off when the tub is not being used. If it is caught soon enough, Spa Shock can often revive the water. Spa shock is a high concentration of chlorine free sanitizer that instantly boosts the level. One should wait at least one hour before entering the tub after it has been shocked. If it is too cloudy it is best to drain the tub and add fresh water. A weekly inspection of the puck dispenser will eliminate running out of chlorine.